Our challenge from Karen's Kitchen Stories is up for the month, and I get to use my new mahlab spice again. 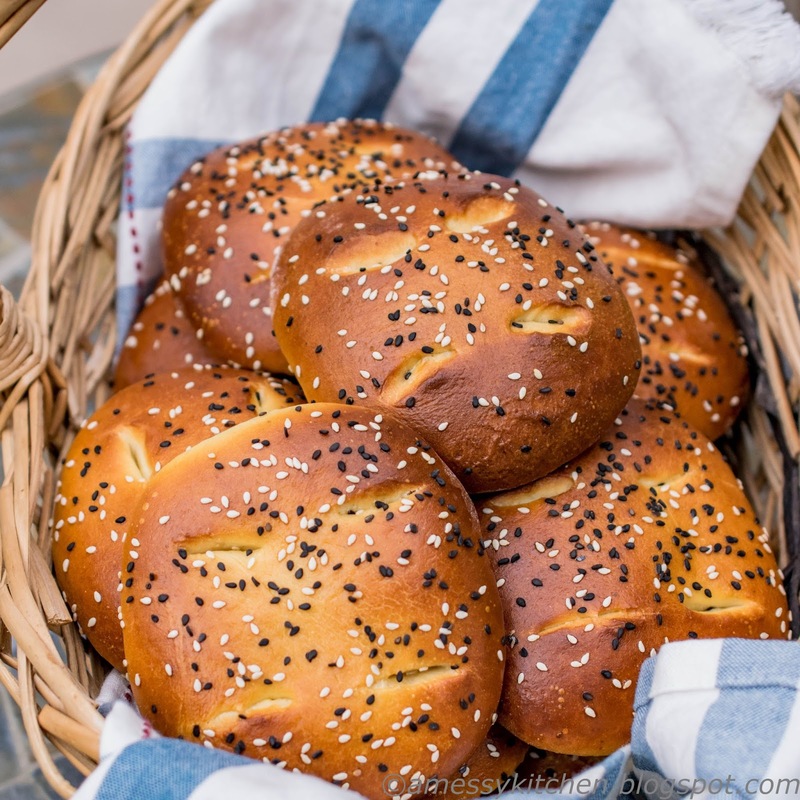 These pretty buns are an Iraqi bread and the name Shubbak el-Habayeb translates to "the lover's window". 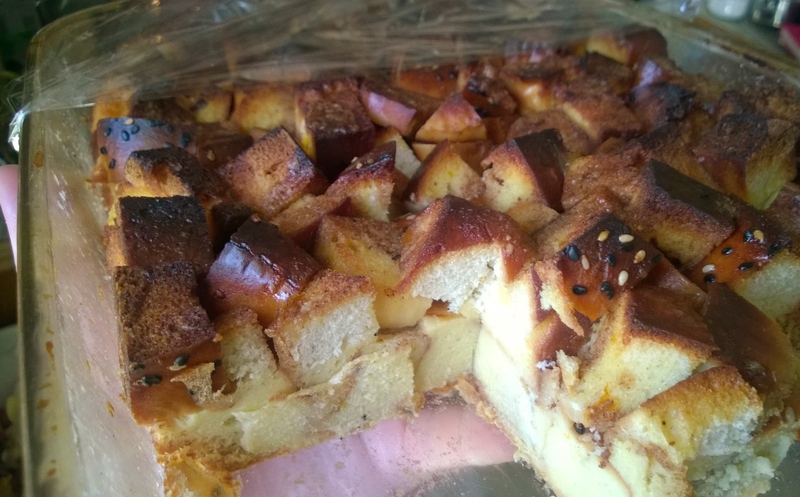 It's a delightful smelling bread, scented with orange blossom and rose waters, as well as cardamom and mahlab spice. The dough smells lovely both mixing and baking! I had bottles of Middle Eastern flower waters, but I understand that the Nielsen Massey versions are much stronger and should be used in smaller measure. I also found that, like many spices, mahlab is best kept whole, so if you get the pre-ground kind, consider keeping it in the freezer to retain its flavor better. 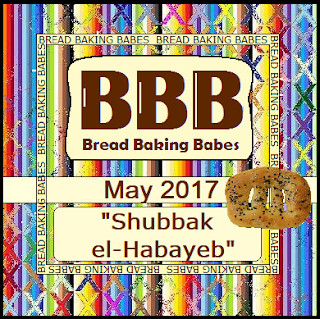 Shubbak el-Habayeb is a bread best eaten on the day it is made. Otherwise, you may want to wrap and freeze the rolls for later. They are wonderful with butter and marmalade, or date syrup, and quite lovely with a cup of tea. Mine turned out with a tight crumb and I think despite adding more liquid, my dough was still a bit too dry. (I don't think I used the whole ½ cup extra that Karen wrote in.) I would recommend using enough liquid to get a nice soft dough. The shaping almost reminds me of a fougasse, and so I think they will work well with a more slack dough next time. I also found that using my fine celtic sea salt, the salt measurement given was too much. It's an average baker's percentage, but for this particular recipe, I prefer less and have seen almost the exact recipe elsewhere with less than half the salt. Now I don't like a bland bread either, so I would go for a happy medium between the two. The sweet little description in the Book of Buns, from which this recipe was taken, mentions that the buns should be eaten while thinking of your true love. I assume that the four slits are to represent one of those window panes with the wooden trim and cross bars. I remember growing up in a room with a large picture window covered with the little wood frames to make it look like dozens of little window panes. It looked out onto our pear trees and deck. Loved that house. I guess these can be reminiscing buns as well. ☺ Our host kitchen did give a substitute for mahlab if you find it hard to come by: 1½ tsp ground cinnamon, ¼ tsp ground cloves, ¼ tsp ground bay leaves: mix together and use measure for measure in place of the mahlab. 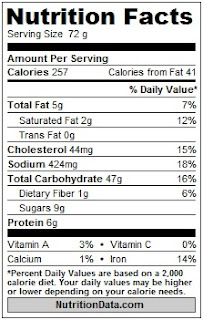 I also read in my last recipe that a hint of almond extract can also be added for mahlab substitution. 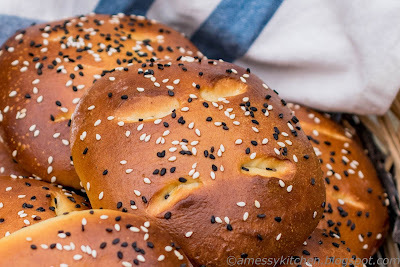 So with or without the special ingredient, we would love for you to join us in making these aromatic buns this month. Check out the host kitchen's blog for the original post and pictures of the special ingredients. You don't have to have a blog to participate, a picture will do. Just send a picture or your post of your finished loaf to the host kitchen by the 29th of this month. 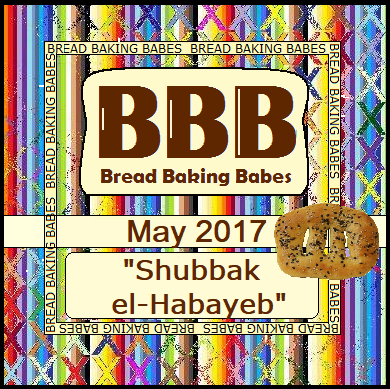 You will receive a Bread Baking Buddy graphic to keep or add to your post, and be included in our Buddy round up at the end of the month. New recipes are posted every month on the 16th. Check out our Facebook group to see most of the Babes' baking results during that time. Place the flour in a bowl and mix in the sugar and yeast. Create a well in the middle and add the milk. Pull down some flour from the sides to cover the milk. Cover the bowl and let rest for one hour. Add the eggs, flower waters, cardamom, mahlab, and salt to the flour and milk mixture and mix with your hands to form a rough dough. Turn out onto an unfloured counter, and knead for 10 minutes, or knead using a stand mixer. Add the butter, and knead for 10 more minutes. While kneading, if the dough is too stiff, dip your hands in the extra water, and continue to knead. Continue dipping your hands in the water and kneading until you have a nice, soft, elastic dough. You can also do this with a dough hook, adding the water one tablespoon at a time. Place the dough into an oiled bowl and let rise in a warm spot, covered, for about two hours or until doubled. Turn the dough out onto a clean work surface. Divide dough into 12 equal portions and form them into balls. Cover with a towel and let rest for 15 minutes. Roll each ball with a rolling pin into a square that is about ½ inch thick. Cut the dough with a sharp knife to make short vertical cuts in each quadrant of the dough for a total of four cuts. Open the slits with your hands to make sure they are cut all the way through. Place the squares on two baking sheets lined with parchment, putting six squares per pan. Cover each sheet pan with oiled plastic wrap, and let rise for one hour. Preheat the oven to 425ºF (220º C) with the oven rack in the middle of the oven. Whisk together the egg wash ingredients and brush over the rolls on one of the sheet pans. Immediately sprinkle with the sesame seeds. Bake the first pan of rolls for 13-15 minutes, until golden. Remove from the oven and cool on a wire rack. Repeat with the second pan of rolls. And here is what I did with some of mine: Pan french toast! It was fabulous! Wow! What gorgeous color you got. My crumb was very tight as well. The dough seemed soft and supple enough. I chalked it up to mostly whole wheat flour and no sugar (I omitted it all, of and that's why I didn't get such color - ok will add some next time. Looks wonderful Kelly! Thanks, as always, for baking along! Great tip to store ground mahlep in the freezer. Mine didn't have much flavour (even though it wasn't old). Lovely golden brown colour on yours, beautiful! beautiful buns, they really do look like masks here. the perfect colour! They look perfect. Love the colour you got. Oops!! There are supposed to be four slits?? Oh dear. How did I manage to miss that part of the instruction? Your buns look gorgeous. I love the golden colour. Brilliant! 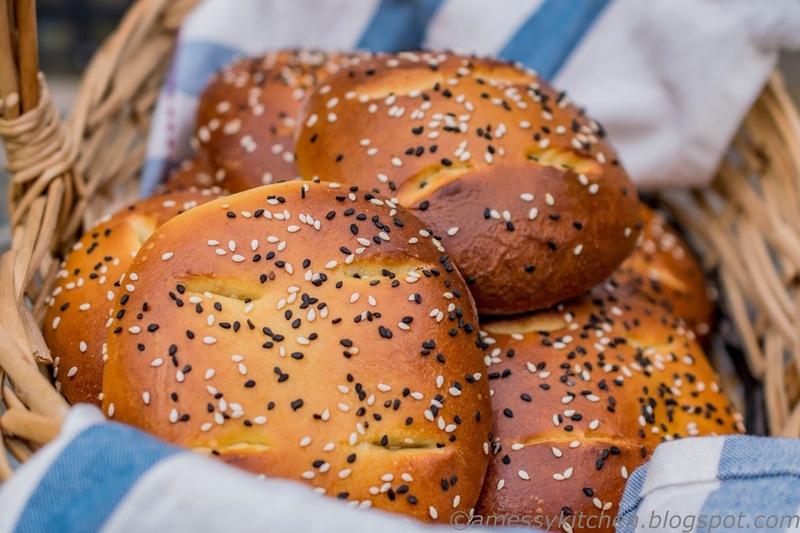 Lovely golden color and I like the two colors of sesame seeds. I love love love the golden color of your rolls! I may have to make a spelt version of these rolls as well. They are fabulous!